Good morning lovely readers! I'm kicking off a new collection today - the My Favorite Things Collection from Superficially Colorful Lacquer! Today I have 2 out of the 12 to show you - All the Purple in the World and The Search Tempest. 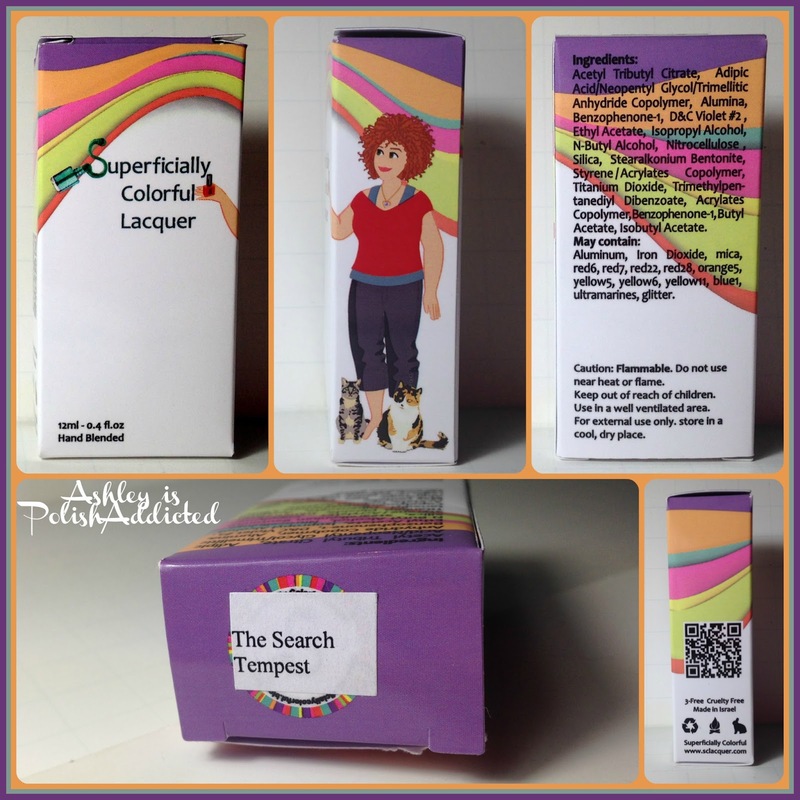 Before I show off the polishes I want to show off Superficially Colorful's awesome boxes! I helped her design these after she had the initial design ideas and I think they turned out pretty awesome! I love having that little piece of the maker with each polish. And I also love that she added the sticker with the name of the polish on the top of the box for storage purposes! Also please note that the bottles in this post are the official bottles but only The Search Tempest has its official label. Since I received these before the release date I have several hand written labels but all purchased bottles will have the official label! Now, onto the polishes! This collection consists of 12 polishes and is inspired by our nutty group of friends and some of the names are pretty crazy as well! 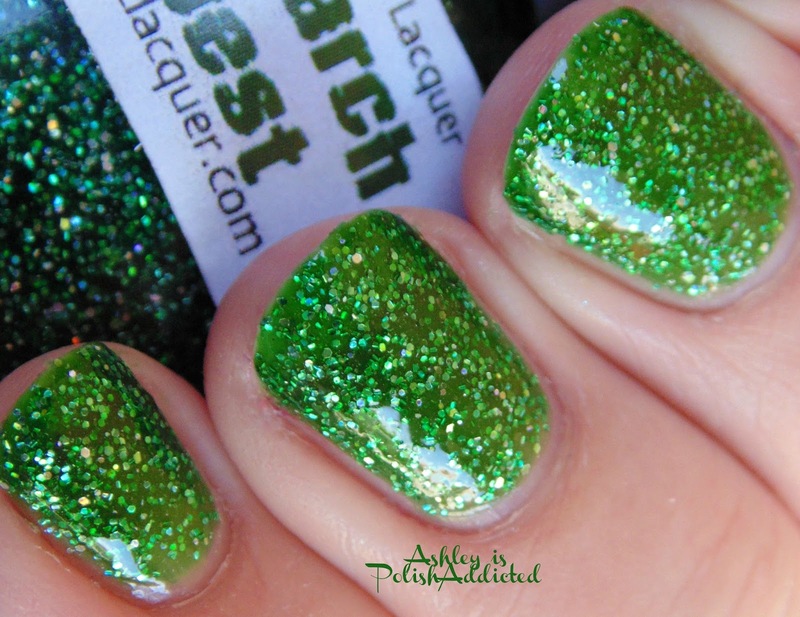 All of the polishes in this collection are glitter jellies and have excellent formulas. All are opaque in 2-3 coats (depending on how thick your coats are). I had no issues with formula or application at all. I used 2 coats and one coat of top coat for all photos. These are so sparkly in person! My camera went crazy and I could not capture how blingy they truly are. All the Purple in the World is a red-toned orchid purple. We have a lot of purple lovers amongst our group of friends so this one was a must! This one is so fun and rich all at the same time! The Search Tempest is named for one of our friends who can find whatever you're looking for - no matter how odd the request! 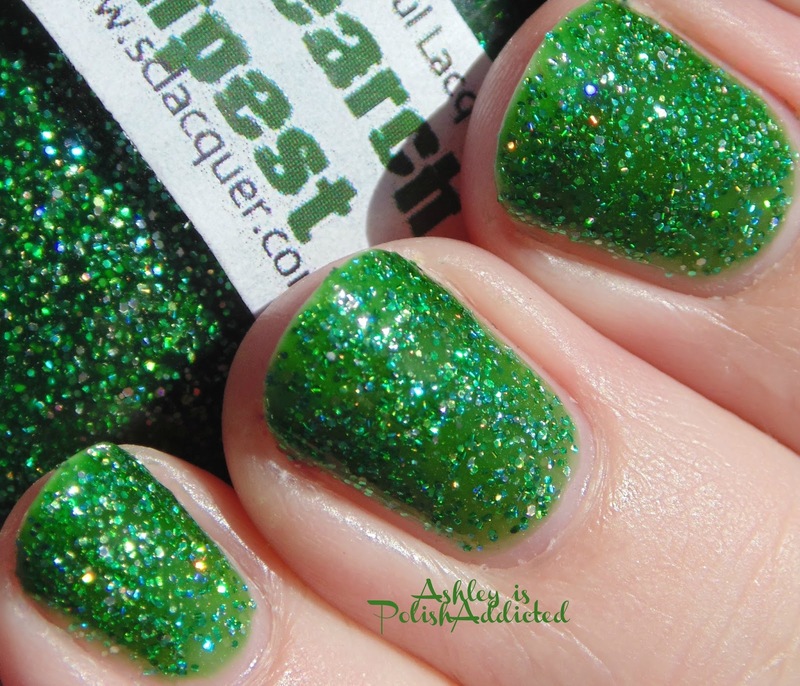 This is an emerald green and really glows from within! I can't wait to show you the rest in this collection! These are available now at the Superficially Colorful shop here and they retail for $9.00 each. She ships out of Israel but world-wide shipping is available. 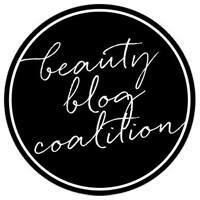 You can follow her on her blog here and at the links below to stay up-to-date on the lastest news and collections!